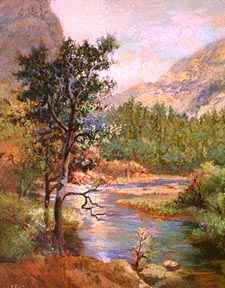 Discover significant landscape art tips and more by clicking on each painting on the left side of this page. This is a selection of a dozen from many paintings that have been purchased online that are in homes and offices across the United States and overseas. It took me years to discover these tips, but I've presented them here for your enjoyment and growth as an artist. As you read the tips found on the pages below, you will receive valuable suggestions on how to improve as an artist. Read what famous artists and art lovers have said about art as well. Learn how to avoid design traps in your landscape art. Learn how to mix clean colors. What type of brushes should you use for your paintings? Learn how to use color and develop your visual memory. Discover four elements each successful painting must have. Read about sculpting with light and choosing your center of interest. Learn how to stage your painting. Learn to create excitement in your paintings. Learn design mistakes to avoid. Add contrast to your art. Click "Gem in The Sun." Use abstract elements in each painting. Learn more design mistakes to avoid. L andscapes have functioned for hundreds of years as windows in walls. Even though you may be living in a busy city, the painting on your wall can open up a wondrous world - just as though you were looking out a window with a fantastic view! Landscape art can enhance your life! If it's well done,you will be drawn into the painting so that you can imagine yourself living in it. Artwork can convey an emotion so that through it a feeling of peace may enter your home or office. The feeling may be that of majestic wide-open spaces. Instead of being closed in by concrete, you have an escape right through the frame on your wall. Art is a wonderful investment in your sense of well-being! The landscape art actually appears to be an escape from hectic surroundings - a vacation on your wall! So to beautify your home, purchase landscape art. The paintings you select to display in your home make a huge difference in the beauty and style of your home decor. The style of painting and its frame can give to your home or office contemporary, classic, country, western and other interior decorating looks. A skilled artist has the ability to draw you into the painting so that you can imagine yourself living in it. It becomes an escape from hectic surroundings - a vacation on your wall! One of the most appreciated gifts you can give for someone's birthday, wedding, anniversary or Christmas is original artwork. It's one of the only gifts that will be a treasured legacy to pass on to your descendants for them to enjoy for years to come. What a gift to give to loved ones! It's actually a family heritage!